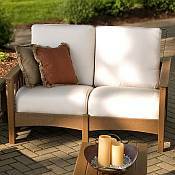 The POLYWOOD® Deep Seating Club Mission Settee is characterized by uniting the classic mission and club seating styles. This fusion is complimented by the superiority of contoured, marine grade cushions with Sunbrella fabric. Choose from 6 furniture frame colors.